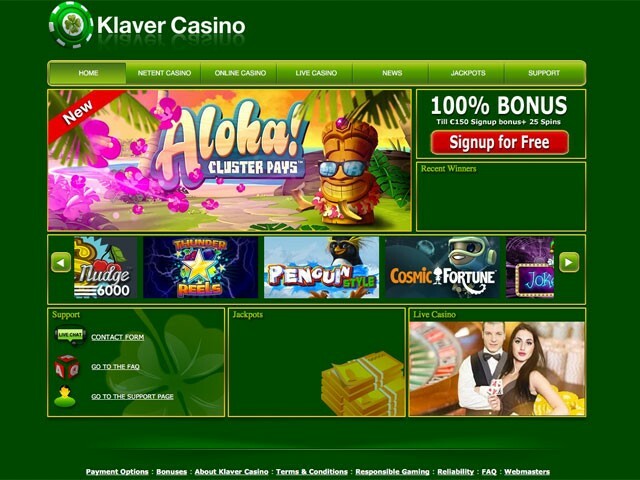 With the color palette featuring bright shades of green, Klaver comes across as a user-friendly modern casino with mobile-oriented design and a nice range of games. Making your gambling action more exciting, Klaver offers a package of regular bonuses, while providing safe, secure and totally trustworthy gaming experience. The highlight of the casino is a good selection of live dealer roulette games that create an immersive and truly engaging environment. Klaver is a no-download casino that is played straight through a browser. The roulette games on offer come from Net Entertainment, EGT and Portomaso Gaming (PG), with table limits starting at $0.1 and reaching as high as $5000. Besides, players can often select whether to play at a low, medium or high stake table within one roulette game. The maximum cashout amount is capped at €5000 per day, which is a fairly high value as compared with other online gambling venues. Depositing options are limited to MasterCard/Visa, Neteller, Paysafecard, Moneybookers and bank transfer, with the minimum deposit for this casino being €20. five live roulette games from XPG. The bonus program devised at the casino focuses basically on slot aficionados, but roulette fans can still benefit from some of the casual promotions that may run at Klaver from time to time. All ongoing and latest promotions can be found on the News webpage on the casino’s site.